Irish Drummers; John, when did you start drumming? I was 15 actually. I come from a musical background because my dad is a traditional musician so we always had music in the house. I’m one of a family of 10, but I’m the only musician, but everyone loves music. I actually took it up and made it a full time thing although it wasn’t a full time thing originally. I finished my Junior Certificate and then went on to be an apprentice electrician but I broke my hand and I didn’t get the job so I ended up working somewhere else. I worked 8 to 5 for about 12 years then decided that I had enough. Irish Drummers; At the start, did you take lessons? My first lessons were with a guy who would become a great friend and mentor called Peter Di Benedetto, who unfortunately passed away about 5 years ago. He came from a place in Canada called Prince George. Limerick at the time only had 1 or 2 drum teachers but this guy brought a lot of new ideas and apart from drums played piano and guitar. So he was a hugh influence in my early years which was so important at that stage and that's how I started. I went to Berklee College, in 1979 for a summer course. It was fairly full on. I got there in June and came home in August and was a fairly intense programme which benefited me greatly. I did get the option to stay on but obviously with a family of 10 it was a commitment I couldn't afford. I got to play with some great musicians and that was an enjoyable experience. Irish drummers; Who were your drumming influences around that time? 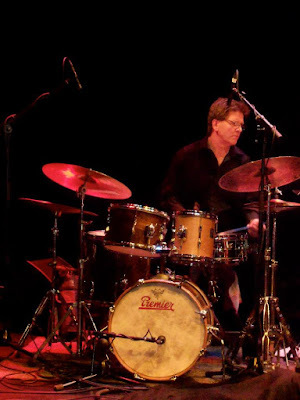 There was an incredible drummer in Berklee at that time called Alan Dawson. He was one of the teachers, an amazing guy, superb musician and such a humble man. I never got to study with other guys. I heard him playing and I loved his playing. He was one of the major guys but I suppose my favourite drummer going back was Joe Morello who played with Dave Brubeck. To me this guy had everything, just incredible technique. He was a classical violin player before he started drums but he had such a beautiful feel on the kit, some great ideas, different time signatures which kind of got me into all of that stuff. Of course there were the great big band guys like Buddy Rich, Louis Bellson and later Steve Gadd came along and he was such a big influence. I love all the drummers. Art Blakey, Max Roach, Ed Thigpen, Elvin Jones, Roy Haynes and Tony Williams who were so great, I like listening to more recent guys like Eric Harland and Mark Giuliana, there are so many great drummers playing now and we can access that. Irish Drummers; Do younger drummers have an advantage now due to so much access to technology and social media? Definitely and in the academic side also. There’s a lot more people now going to college and they’re very educated when they come out of that system. Years ago, you learned by going and listening to jazz musicians and listening to recordings over and over, where as today it’s all at your fingertips and everything is broken down, technology is a huge advantage. Irish Drummers; John, someone starting out on a career in music, what advice do you give them? What I’d normally say to the kids is, you have so much information available to you now so you have to know how to use it. There’s so many different distractions now as opposed to back in the 70’s when you’re learning it was your main focus because you didn’t have internet, all you had was TV. In Ireland, we couldn’t see all the great musicians because we didn’t have that stuff on the TV. Today all you have to do is go on YouTube. It doesn’t help a lot if you don’t know how to handle the information. Filtering information and taking it bit by bit is the only way you’re going to learn something like this. It does take dedication and it does take practice, lots of practice, there are no shortcuts. I certainly don’t believe there are any shortcuts. There are very talented people out there who learn things much quicker than others, but there are no short cuts. Technology has made us more impatient I believe and I see it in young students who don't want to practice but want to sound like a pro in a short space of time. That's when they get bored and either switch to another instrument or give it up altogether and regretting it later. 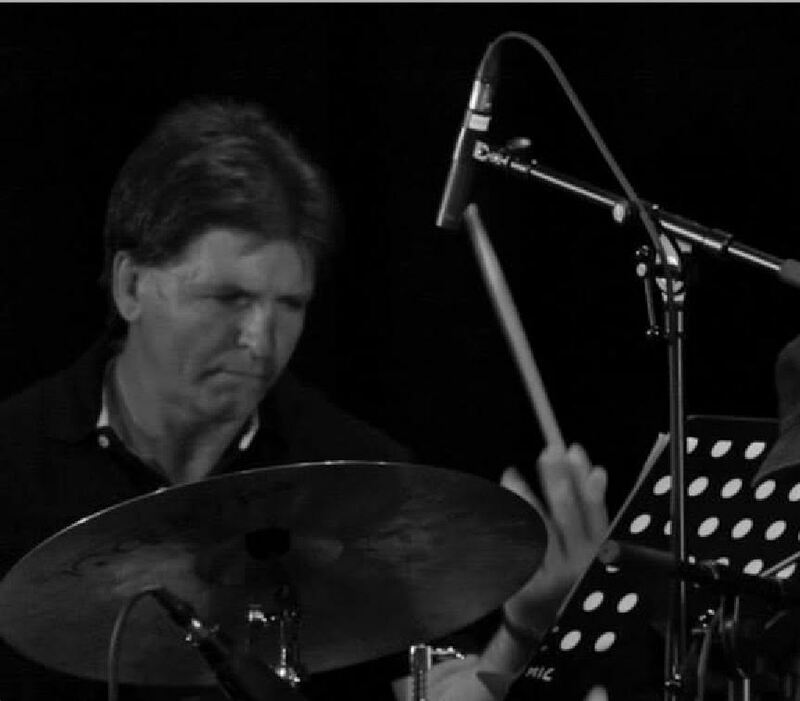 Irish Drummers; John, your synonymous with the Limerick Jazz festival, how did the festival come about? Well, jazz has always been going on in Limerick. I’m going back to the showband guys who had always been playing jazz in their spare time, they learned to read and do the stuff that was out there and the music they had access too, like the Big Band stuff. A good friend of mine did all that stuff and he did a Berklee correspondence course which was available back in the 70’s. Limerick has always had jazz as far back as I can remember. I got involved in the late 70’s and then in 1981 the Limerick Jazz Society was formed and I was just on the committee at the time. I was helping out but eventually time moved on and then I became the chairperson. Irish Drummers; What was it like at that time? There was very little funding available at the time from anywhere. We had Louis Stewart, Noel Kelehan, Jim Doherty, Johnny Wadham and the Buckley family. There were so many great players and they all came down and we got to know them on a personal basis which was very important to us and the support grew and that was the start of the Jazz Society. We are 36 years old this year (2017) which I think is an amazing achievement. This is the longest running Jazz Society in the country and I don’t even know if there is another Jazz Society in the country at this stage. The Limerick Jazz Festival is 6 years old which was a dream of mine to take it a step further. It had gone really well for us and this year is the 1st year we’ve had a sponsor as well, which is really difficult to get so we’re really happy about that.Doing the administration work was always the hardest. People only see the finished product, they don’t see what goes on behind the scenes. Irish Drummers; Can you tell us some of the main acts coming to Limerick Jazz festival 2017? Some of the artists coming are Soweto Kinch, he does the crossover thing, he does hip-pop,rock and jazz, so he’s bringing his band. We have the James Taylor Quartet. James Taylor really communicates with the audience and he’s a very hard working guy. He has the real hard funk, blues kind of thing, which I think will go down really well. We also have the Booka Brass Band, 5 young guys who are doing arrangements with popular music. We also have the Dublin City Jazz Orchestra coming. They have been here 3 times before and they’re very popular and this year they have 2 vocalists, Pia Dunne and Keith McDonald. I don’t know Pia Dunne that well but I know Keith McDonald, I played with him before and he’s a very fine singer. They’re doing songs from a 100 years ago (1917) and rearranging them for big band which will be very interesting. We have formed a Limerick Jazz workshop called Little Big Band which is a 10 piece band and they will be doing their own arrangements of big band numbers. Electric Freeplay featuring Joe O' Callaghan, another great musician. We have different things going on like free workshops, music on the street, a jazz trail on the 21st and the festival is on the 22nd 23rd and 24th of September. Yes with a very good friend of mine, Tony Miceli, a great vibraphone player. We formed a band called the Modern Irish Jazz Quartet back in 2012 and our first project was a tribute to the Modern Jazz Quartet. It featured, Phil Ware, Dave Redmond , Tony, Phil, Dave and myself. We did an album which is available here.. http://www.jazzireland.ie/jazz-shop/irish-jazz-albums/miq-plays-mjq.html. After that we picked and rearranged some Irish tunes which featured saxophonist Richie Buckley and this year Michael Buckley played with us. It was lovely tour and it was really nice to get to play with these guys. Irish Drummers; What’s your drum gear set up? I have different setups. 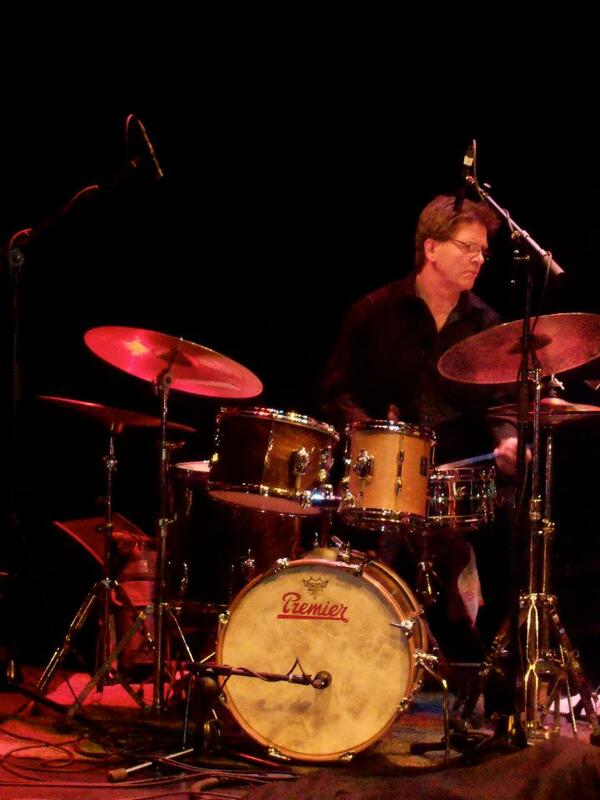 My jazz setup is a small Premier kit, Birch shells 18 x 14 bass drum, 12 x 8 rack tom and 14 x 14 floor tom. I also have two old snares, a Premier wooden 5in with parallel snares 1958 and a metal Gretsch 5in 1972. My cymbal setups are varied depending on the gig. I have seven rides, Zildjian A's and K's, Jack DeJohnette Sabian flat ride, Mel Lewis Istanbul, all 20in. For Hi-Hats I use 13in Turkish, Zildjian Constantinople or A Custom and some Zildjian crashes 14/ 15/ 16. So I reckon I'm for all occasions. My bigger setup is a Mapex Orion 20 x 16 BD, 10/ 12/ 14/ 16 toms, 6in Ayotte wooden snare, 14in K HHats, 20in Rock Ride, A Zildjian, 16in crashes A Zildjian and Meinl Byzance 10in Splash A Zildjian, 18in China A Zildjian. Irish Drummers; And what sticks are you using? The sticks I’m using are Vater Manhattan 7A, they’re my preference. I like the weight of them. I like the tips, wooden tips, I don’t like nylon tips. I like the sound of the stick on the cymbal. There are so many different cymbals and there’s so many sounds on a cymbal. Irish Drummers; John your involved in so many projects, what is the main focus over the next few years? Well I suppose different things come up. The whole music scene has changed especially with the recession, that was tough for me and I had to re-invent myself, taking on different projects. You have to think outside the box and diversify. As a professional musician you never know what’s coming. You have to be prepared for change and prepare to do what needs to be done. You’re always trying to think of new ideas and that’s always in my head like where do I go from here. Running the jazz festival is great because it gives me contact with musicians from all around the world and I think that’s a great thing because I get a chance to play with some of the musicians and I think that’s fantastic. You get to know these people and they get to know you and when you bring these people over hopefully they’ll reciprocate and you’ll get to play with them and I think that’s what a lot of musicians do in this case, you bring them over and do the gig. You get a call back and they bring you somewhere. I’m hoping to go to Philadelphia soon to play with Tony Miceli. I’ve been there before and I hope to be back there soon. Where I am at the moment, I’m kind of wearing 2 coats, one as a promoter and one as a musician, so I get to see both sides. Irish Drummers; I’ve talked to a lot of drummers and they’ve encouraged musicians to go abroad, study abroad, play abroad. You would obviously agree with that. Definitely, there are a lot of musicians here, l went to Berklee (Music College) in Boston in 1979 and that was a real eye-opener. It was a very condensed 3 month course and I learned a lot from that experience and got to meet and play with some great musicians. It didn't happen that often back then, I can remember Brian Dunning, the Flautist going there before me and Mike Nielsen after me, so it was something that didn't occur on a regular basis. Now we hear of these young musicians from Ireland travelling to Berklee etc. I think that is a great thing and they learn a lot and gain great experience. Irish Drummers; John, what makes Irish drummers unique? That is a tough question to answer and I'm sure that everyone you ask will have a different reply. For me it was a lack of information and literature on drums and drumming which made me more eager to perfect and hone my particular skill set. As I mentioned earlier, I didn't have internet and You Tube so I did it the hard way by listening to vinyls and cassettes and replaying them over and over until I mastered what was to be played. It took many hours and I developed good ears in the process and that is a major factor in how I perform. I hear lots of Irish drummers and see how they have progressed over the years and this is just great. They write and arrange their own music which was rare back in the 70's and 80's. Irish Drummers; Outside of drumming what interests do you have? Irish Drummers; Is there anything you would like to ad? In Limerick we have Dolan's and we’re very lucky to have such a great venue and passionate people willing to support live music. Jazz is alive and well here but only because there are some great individuals willing to give their time voluntarily and I thank them most sincerely for that. Also Louis Stewart’s first anniversary was last week (deceased since 20/8/16, RIP) it’s very sad that he passed away. I had the pleasure of playing with Louis and he was such a great musician and a real nice and humble man. We have so many great musicians here in Ireland and would like to see them supported as much as possible.